Ivy Terrace is in a privately owned pre-war townhouse on East 58th St. in Manhattan. We are in a very safe neighborhood on the border of East Midtown and the Upper East Side. In walking distance, you'll find Rockefeller Center, Central Park, Carnegie Hall, midtown business addresses, 5th Ave. shopping and museums. The subway is 2 blocks away. 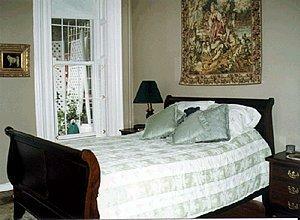 Ivy Terrace Bed and Breakfast offers all the comforts of home. Two of our lovely suites have large, private terraces, to enjoy your morning coffee or an afternoon glass of wine! All of our rooms have newly renovated full kitchens and private baths. Each features beautiful hardwood floors, very high ceilings, a queen-sized cherrywood sleighbed with high quality mattresses, lovely artwork and tapestries, color cable TV with VCR, private phone with answering machine, and breakfast goodies stocked in your room.